Ten years ago this week, I picked an interesting time to leave the borders of the United States for the first time ever. A college friend had convinced me to spend my Spring Break in London with him, seeing some live theater in the West End, catching the traditional tourist sites and indulging in a fair amount of English ales and steak and kidney pies (naturally, my then-less sophisticated palate discovered Strongbow Hard Cider making that my drink of choice for the week. Today the stuff is way too sweet for me to drink and I regret not imbibing more bitter ales). Of course, as we were planning out our vacation and getting everything together, an international coalition, consisting primarily of the United States and England, was threatening to wage war against Iraq. I remember the run-up to this war very vividly – from Bush’s state of the union, to Colin Powell’s sobering evidence of “weapons of mass destruction” and yellowcake uranium. And yet there was a part of me that thought the United States would never become engaged in a war without appropriate provocation. My friend and I left JFK International Airport on a red eye flight and when we landed in London the following afternoon, the British tabloids were already brandishing headlines about the first bombs being dropped over Baghdad. Our country was at war and here I was, traveling international for the first time and visiting America’s staunchest ally in this effort. We were less than two years removed from Sept. 11, when commercial airplanes were used as weapons of mass destruction by terrorists. We had no idea how strict security in London was going to be (as it were, one of the bombings in London’s Underground tube system a few years later occurred at the station near the hotel where we were staying that week). To say I was on edge about this experience was the understatement of my lifetime. Before I go any further, it should be noted that I picked up my copy of Amazing Spider-Man #95 years before I took this trip. I was in junior high school, scouring a box of ASM back issues at a comic book show near where I grew up and saw a nice copy of this book on sale for cheap. It’s an otherwise unremarkable issue, not notable for being the first appearance of any significant characters, or for missing the Comics Authority Code from the front cover (that would happen for the first time one issue later). But I was more than happy to get my hands on any Silver Age issues of Spidey, and I had just enough money left over from some of the larger purchases I made that day, I had to have it. When I took the comic home and inspected its contents, I very likely thought about how great it would be to visit London one day. In elementary school, I was a contestant on the PBS game show “Where in the World is Carmen Sandiego,” and as part of my introductory bio, the host said I dreamed of being a “world traveler” one day, but so far I had only been “to Disneyworld.” Yeah, that sounded as lame as it reads today. Obviously, this comic book took on a whole new meaning after I returned from London. 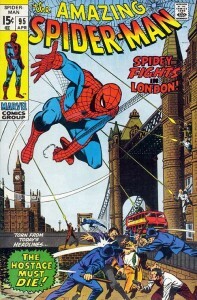 A few months ago, I busted out my digital copy of this issue and initially smiled at the “Spidey Fights in London” headline. I started reminiscing about my trip in 2003 and the anxiety that surrounded it. 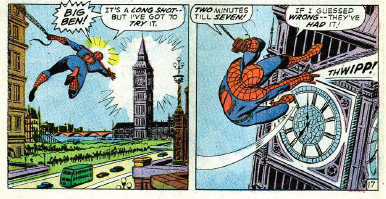 Then I was immediately struck by the fact that Peter Parker’s first trip to London was interrupted by an international terrorist plot involving an American delegate and his son. The cover even screams “tornfrom today’s headlines” (in 1971). 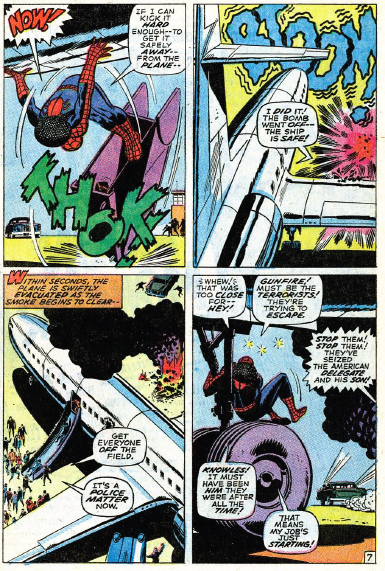 In another instance of that “Old Parker Luck,” Peter has to don his Spider-Man costume, thus ruining his surprise visit to see Gwen Stacy, who moved to London to be with family after the death of her father a few issues earlier. 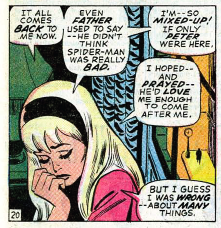 This issue also marks the beginning of the period where Marvel seemed to have no idea what to do with Gwen other than have her cry and cause stress for Peter, which they ultimately resolved by killing her off in ASM #121. Fortunately, my first trip to London went a lot more smoothly than Peter’s. I managed to stay safe and even witnessed some history while I was there. On our second full day in the city, my friend and I went to see Big Ben and Parliament and came across a huge peace protest rivaling the size and scope of what was going on back in the United States at the same time. I then went inside to listen in on the House of Commons – “Congress with a two drink minimum,” as Robin Williams once described in – as they debated the merits of the Iraq War. I obviously had my opinions on the whole thing, but for the sake of keeping most of my politics out of this post, I’ll refrain. Either way, it was fascinating to see the “pro” and “anti” war crowds go at it on an entirely different continent from what I was used to. When we weren’t traversing the city, my friend and I were making frequent phone calls to our families and significant others about our journey. My girlfriend, now wife, even gave me some advice on how to seek a safe haven at a U.S. Embassy if the proverbial you know what hit the fan while we were over there. It never did. We did get a minor scare in the airport on the way back when our flight was mysteriously delayed for a number of hours. After inquiring with customer service, they told us it was just a mechanical issue rather than some kind of threat or security breach. In retrospect, the answer we got probably should have scared us more than the answer we had imagined. I still have my copies of the Daily Mail, The Guardian and The London Times announcing the start of the war safely tucked away for safe keeping. It’ll be nice to pull those out at some point and tell my son about the time I went to London. Then I’ll bust out my copy of ASM #95 and tell him about the far less successful trip our favorite superhero made to the same city. If my son doesn’t understand how this is all analogous, then he clearly hasn’t been paying attention! 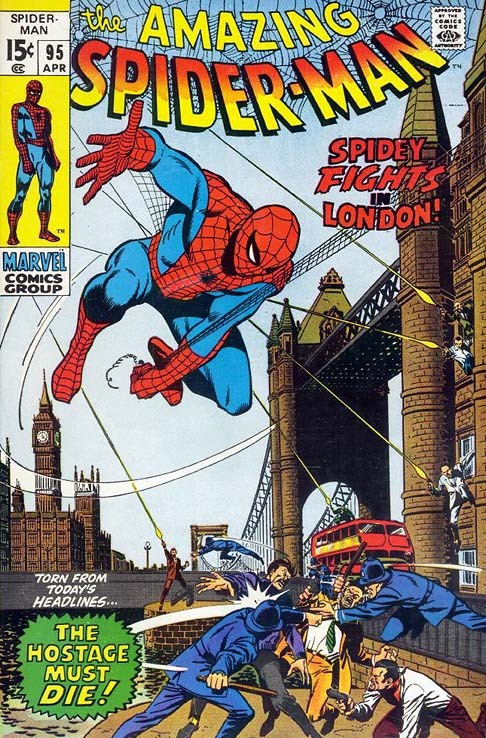 Although the geography’s a bit off (for instance on the cover Tower Bridge is nowhere near Parliament), I found this issue to be one of the better presentations of London in US comics. Some can be incredibly off, almost bordering on the offensive – in particular hardly anyone in London speaks cockney. One of the worst was Web of Spider-Man #20, though it’s far overshadowed by the delicate and subtle approach that that issue doesn’t take to the IRA.